The internet is like a loud, crazy rock concert where everyone is trying to scream at once. You can’t hear anyone above all the noise, yet you crave to be heard. This is where starting a blog with a reliable web hosting solution like Bluehost can come in. 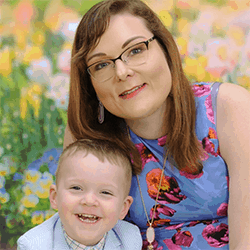 With my special link, it is only $3.95 a month to get started. You can use the blogging platform to convey your message to millions of people online. 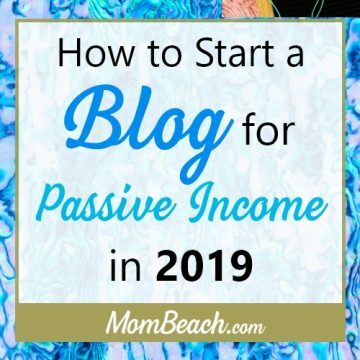 In this article, I teach you how to start a blog for a passive income stream in 2019. It can be difficult to be heard at first at this internet rock concert, but it is possible to take center stage and promote your cause. Literally speaking, I am meaning the first page of Google! 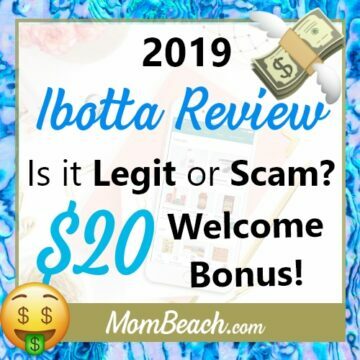 I have been blogging only 2 months as of this update (December 29, 2018) and have already earned almost $100 with this blog. Anyone can make money by blogging with affiliate marketing. 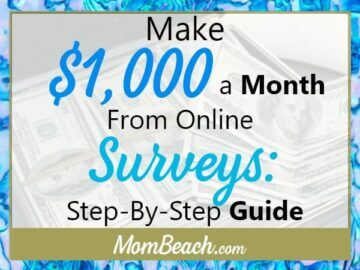 I tell you how to monetize your blog as well in this guide. Let’s get started! What on Earth do you wish to write about? That can be a daunting task for any fledgling blogger. 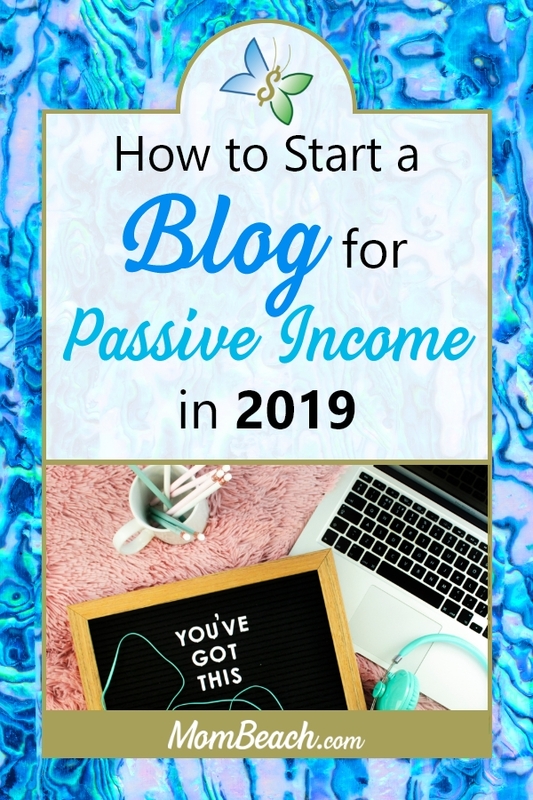 It is better to ask the question “How can I serve my audience?” If you have an audience, then you can create a passive income while you sleep with your blog. What do you know that might help someone else? If you are just writing for yourself and not caring about whether you will make any money, then a niche won’t really matter to you. If you are a talented writer then I’m sure you can write about unclogging the kitchen sink and get several subscribers! Once you have your niche down, you need to find some keywords to give you an idea of the best topics to write about. A free service that I like to use for finding niche keywords for my Shopify store is Keyword Niche Finder. It lets you search for keywords relevant to the niche you have chosen, which can be handy for getting ranked in Google with SEO. Keywords can be awesome for choosing your blog’s name. If you have a popular keyword as part of the name then it can help with SEO as well. Try to think of a .com or .net as they are the easiest to remember. There are several other extensions available too like .co, .style, .shop, etc but I don’t recommend them. Avoid using .org unless your site is a non-profit organization. I think sites that are for profit and use .org as misrepresenting themselves to customers. Use at least one popular keyword in your niche for Google to understand what your site is about so it can index it better. 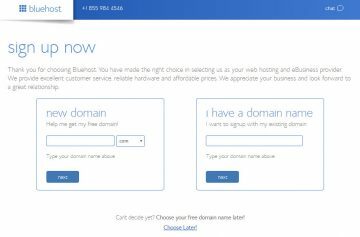 There are several web hosting solutions out there, but after reading reviews for the most reliable, I came across BlueHost. The customer service and support at BlueHost is amazing and the price is low at $3.95 a month. You also get one free domain name for your blog! 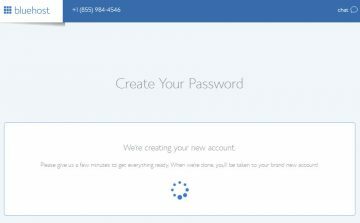 For this tutorial, I am using BlueHost. 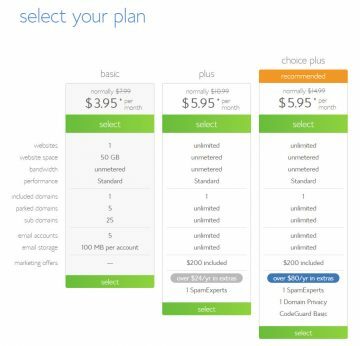 Once you have clicked the sign up button, you are directed to select what plan you want. It is up to you! Then, you are prompted to enter your domain. If you had decided on one in the previous step, then you can click “Choose later” at the bottom of the two input boxes. You can check to see if your domain is taken or not too. Your account will then be created so sit back and watch the swirly. Hypnotizing. ? Another screen will come up with some free themes you can pick from. You can either decide now on a theme or click the “Skip this step” link at the bottom of the theme list. I’m going to go ahead and select the pink theme in the center but I will show you how to change themes later. 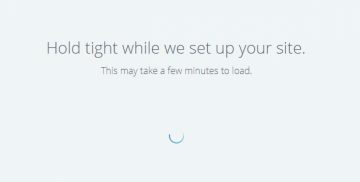 After the blue swirly is done, a blue button comes up that says “All Done!” If you click it, then it will bring us to our next step. You can choose a business or personal account – its up to you. 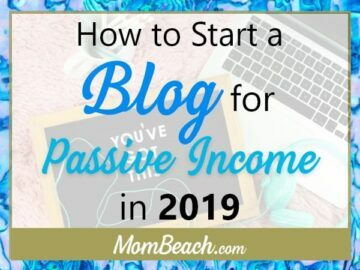 I’m going to choose “business” for this tutorial since I imagine that most people reading this want to learn how to start a blog for a passive income. 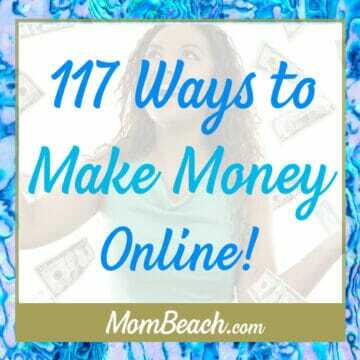 You will need to have a business of some type if you plan on making money from your blog. See my article on how to start a business here. After your WordPress set up is complete, you can then pick a title and description for your blog. In the description, make sure to use keywords from your niche from theÂ Keyword Niche FinderÂ tool we spoke about above. 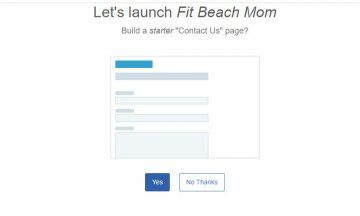 I’m calling this blog Fit Beach Mom in the example. On the next screen, you can choose to update your blog with news or blog posts. It is a blog so I recommend you do so! You can choose to display a static page on your blog or show your blog posts on the first page. It is up to you. 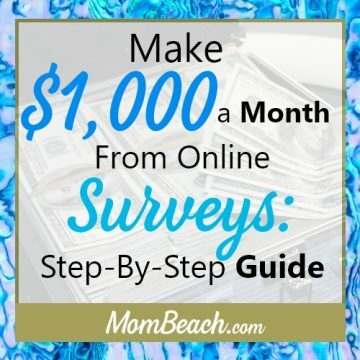 This blog, Mom Beach, has a static first page so that I can tell customers what the site is all about before they dive into reading the blog posts. It is great to have a contact page for your blog so your visitors can get a hold of you if they need anything. Also, a sponser might need to discuss business with you. Definately opt for creating a contact page as the next step. On the very next screen, you can connect Jetpack to WordPress. 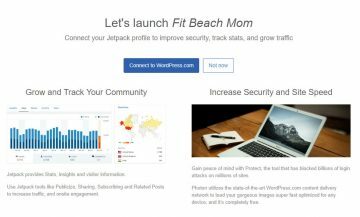 Jetpack is an awesome plugin that helps your site run a lot faster, as WordPress sites can be slow. The faster your blog is, the more likely you will not lose visitors. I would definately recommend that you connect Jetpack in this step. Enter in your address information, whether you use your home, business or a P.O. box. You can opt in for Whois protection as a service when you signed up or can add that service later. 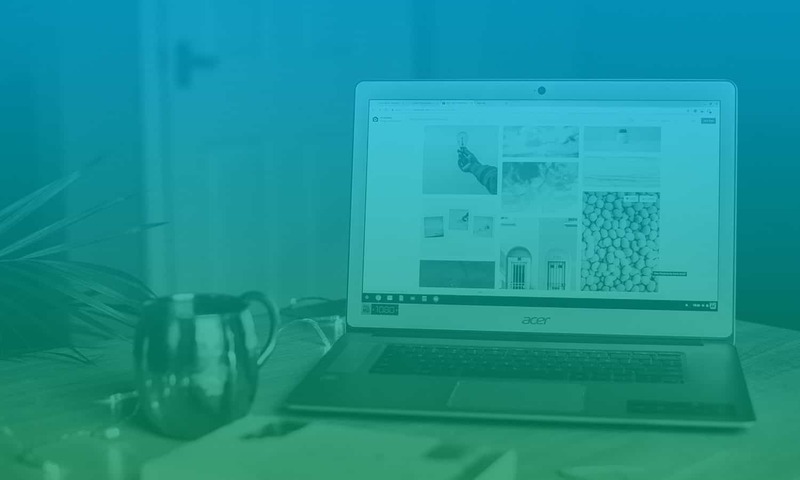 If you’d like to sell items on your blog, then you should install the Woo Commerce plugin. 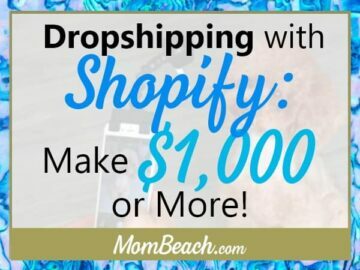 I’m going to skip it in this tutorial since I don’t plan on selling anything. On the next screen, click the “customize your site” button to be led to the following screen. This is the layout options for the selected theme. It looks pretty plain Jane right now but you can fix that easily by adjusting the theme settings. Layout – This is the header, footer, blog, sidebar and container. Each part of the blog is a separate component that you can change settings for. Colors & Background – Here, you can pick the color of the text and links, and the background colors for the site’s footer. Typography – What fonts would look best in your blog? You can leave the settings as they are or change to whatever fonts you’d like. Buttons – You can configure the buttons sidewide in this area. It is important to have a bright CTA or Call To Action button so you get ultimate conversions. Use this color sparingly in the site for the best user experience. Menus – You can change the layout of the menus in this area. Right now, we are displaying blog, contact us, home page and sample page. You can rename the titles to whatever you’d like. Widgets – This is where you can bring in plugins that you have installed into the site. I’ll get to what plugins are the best to start with later on. Homepage Settings – If you want to have the homepage to list your latest posts instead, you can change it here. Additional CSS – Leave this alone unless you understand CSS, cascading style sheets. It is code that stylizes your site. I may have a CSS video tutorial down the road to teach you CSS in the coming future. Let me know in the commets if you’d like to see this. Click the “X” at the top left hand corner to get to the WordPress Dashboard once you have adjusted the settings properly. 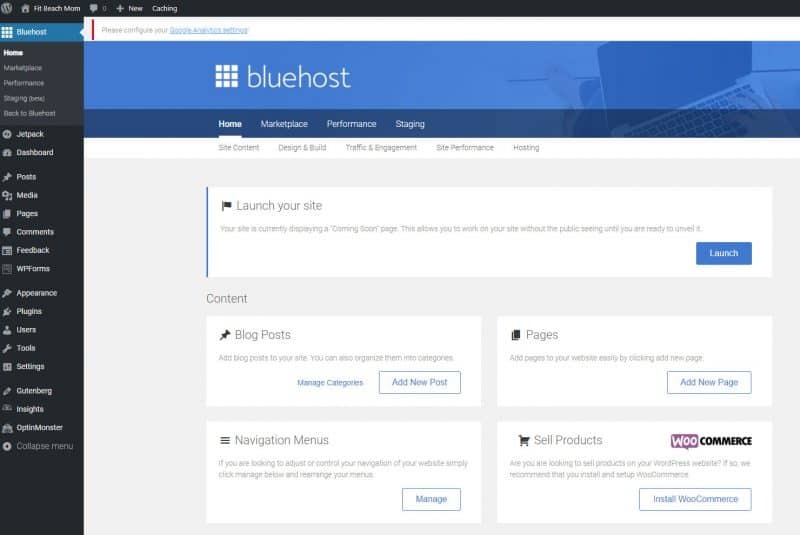 Bluehost Home – This is where you can quickly add a new post or page, change menus and install WooCommerce if you want to sell anything down the road. Posts – Where the magic of your site happens. You can create and edit your posts here. Media – Think of this as your site’s library of images. You can upload and host your image content here. Comments – The comments that people leave are displayed here. You may get lots of spam so monitor your comments regularly. 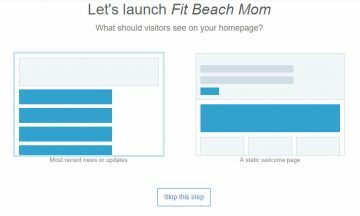 Feedback – In this area, you can see what you may need to add to your site such as Google Analytics, a way to track your site’s visitors. WPForms – This theme I had installed came with this widget called “WPForms”. You may not have it. This widget enables you to create forms like a contact or subscriber form. Appearance – This is where you can change the look and feel of your site such as change themes! Plugins – All of the plugins you can on your site are displayed here. You can search for more, activate the ones you have or deactivate them if you no longer wish to use them. Users – If you want to add more user accounts like a guest poster or comment moderator, you can do it here. Tools – Helfpul tools that you may need are listed here. Settings – You can change things like your site’s title, tagline, description and timezone here. Gutenberg – It is an editor that lets you drag and drop content to edit your posts. It’s a plugin that came with this theme I installed so you may not have it listed. 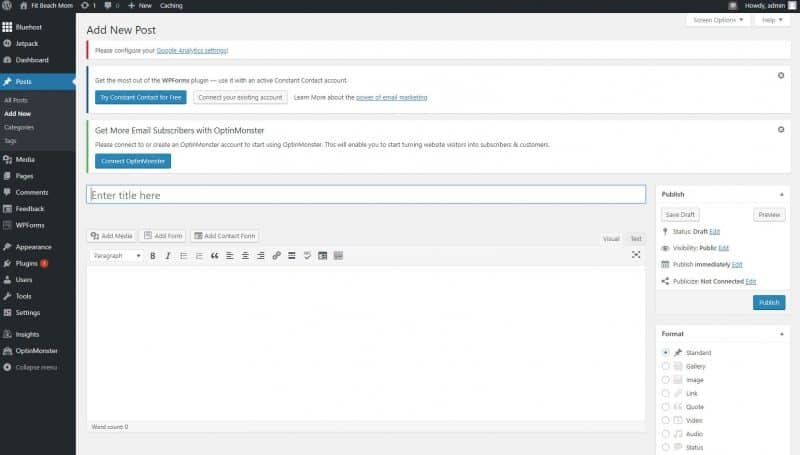 OptinMonster – This is a paid service that helps you manage email subscribers. Having subscribers helps you generate more traffic and sell products easily. Click on “Plugins” to install new plugins/widgets for your blog. Then click on “Add New” and go over the “Search installed plugins” at the middle right. Install now and go through the steps that Yoast takes you through. It is pretty self-explanatory. 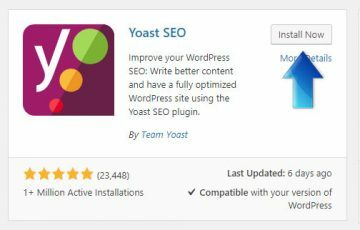 After installing, make sure to activate Yoast right away so you can use it for SEO when making a page or blog posting. For more great plugins, check out this article. Click on “Posts” and select the “Add New” button at the top. You will then get to another screen where you can add a title and content for your post. If you had installed the same theme as me and hade “Gutenberg” enabled, you can either use it or deactivate this plugin. Just go to “Plugins” and then click “deactivate”. Enter in a title and copy for your first blog post. In order to insert an image, click the “Add Media” that is above the content box. To insert a link, click the chain icon in the middle. You can also add a dropquote and align your content in this same toolbar. Play around with the different options in order toÂ learn the best. Some sites I go to for free images to use are Unsplash and Pexels. You can also use a paid image site such as iStockPhoto if you prefer. With Yoast SEO installed, you can begin to optimize SEO easily for your blog posts. 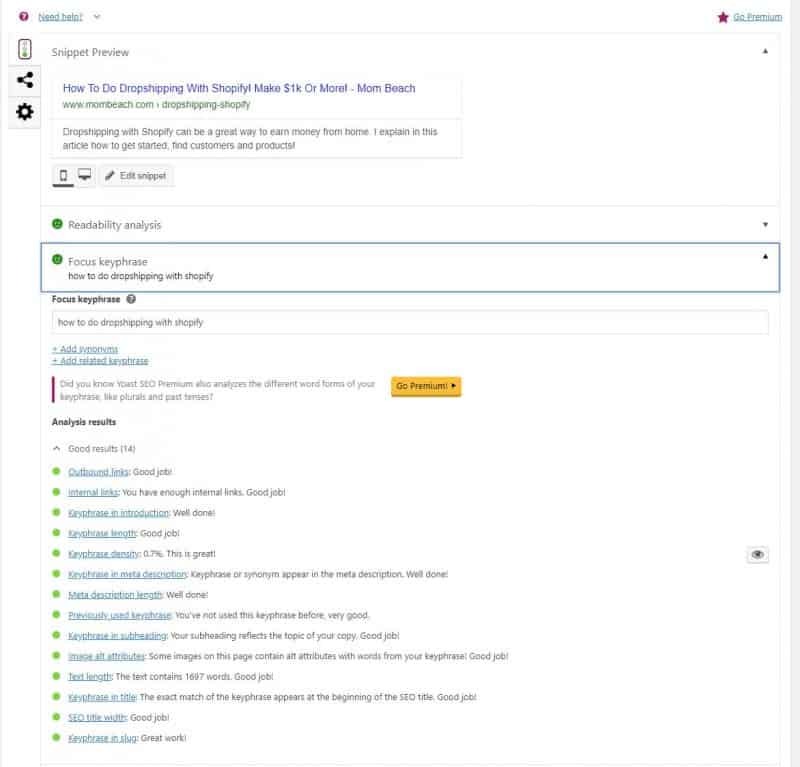 The Yoast plugin will appear underneath your blog content area and will show you what you are missing in your blog post. A red icon will appear next to the action item that you need to address in order to optimize your blog the best. A green icon means you had addressed the issues. 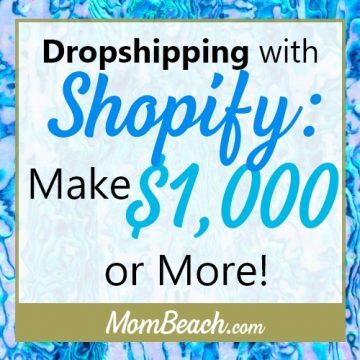 Take a look at my Yoast SEO from my article on dropshipping. If you have all green lights like I do in this image, then you are on your way to optimizing with Google! Another way to optimize for 2020, when most people will be using their voice to search the internet, is withÂ Voice Optimization. With Voice Optimization, you write your blog posts in a conversational tone with no acrynonyms unless they are spoken naturally. For example, SEO is an acronym that most people will say but OMGWTFBBQBYOB is not. Avoid “l33t” speak as well when compiling a blog post. Not only does it look unprofessional but it goes again voice optimization. 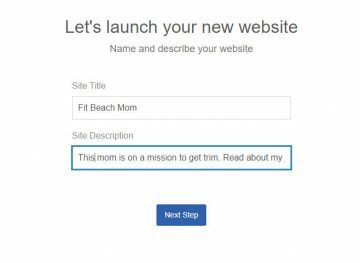 For Mom Beach, as part of my digital marketing strategy, I have been typing as I would speak in order to best optimize for voice. I like to use Skimlinks for general afiliates mostly. Clickbank is another great affiliate program for several merchants. It can take lots of time in order to affiliate with a company and its best to sign up with a tax ID or business EIN number. See my article on starting a business if you are not sure how to obtain these. Some affiliate companies will not let you sign up unless you have high traffic so avoid them for now. If you like a particular product, then you can go into Google and type “product name + affiliate program” to see if that product offers an affiliate. Affiliate with companies that you recommend highly and have personally used so that your readers will trust you more. You can also use ad sites like Mediavine but you have to have at least 20,000 pageviews a day in order to sign up. Affiliate marketing can be done right away when your blog is new. In fact, I’m already using some affiliate marketing for this blog and I haven’t even been posting for a whole week yet. Pinterest is an awesome platform to promote your post on. 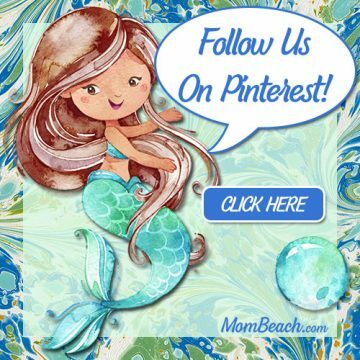 I have been getting lots of traffic by pinning to Pinterest on a regular basis after I create a post. Your posting image should be at least 300 width by 1,000 height to get visiblity in Pinterest feeds. Use easy to read text to stand out when making a pin. I have started to use emoticons on my Pinterest ads and I feel that makes them stand out too. 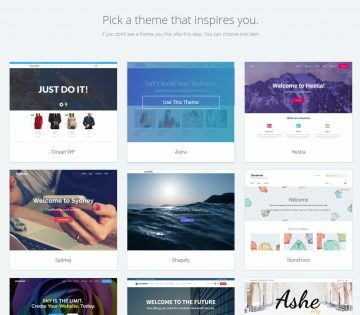 A free image creation tool is Canva. The best times of day to post are 8pm – 11pm EST on Saturdays. For during the weekdays, it is 2 pm – 4 pm EST and 8 pm – 1 am EST. You can use Tailwind to schedule posts if you are unavailable during peak hours. There are other ways to promote your posts too such as other social media platforms like Instagram and Facebook. However, Pinterest is working the best for new bloggers just starting out. 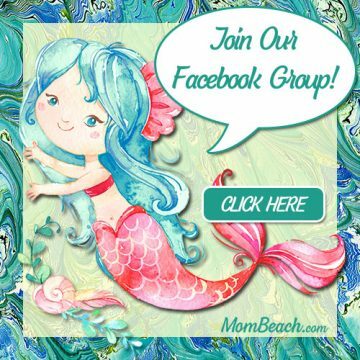 You could use Facebook Ads as well if you have some advertising money laying around. 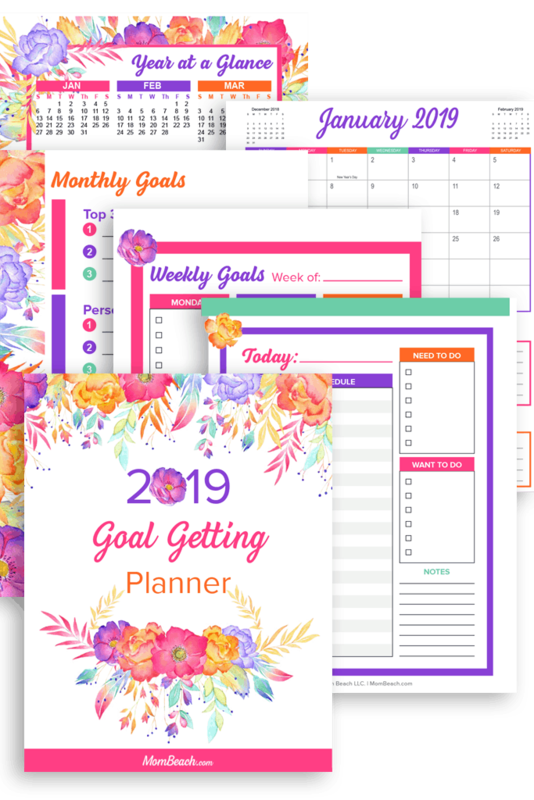 It is important to have a plan of action for you blog in order to succeed. That’s where a digital marketing strategy comes into play. 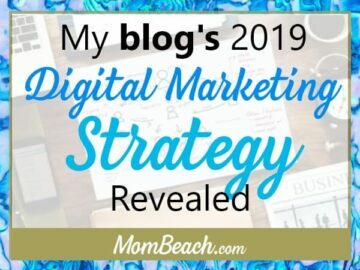 I explain my strategy for my own blog in this article. Feel free to use my ideas to promote your own blog or let me know if you have any ideas you’d like to share in the comments below. It is important to regular schedule yourself to write so you don’t lose focus. 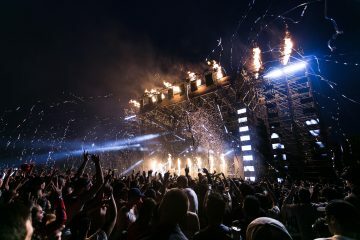 This is a brand new avenue for you to express yourself online in front of billions of people. If you don’t post at least once a week, then your new visitors may lose interest in your blog. 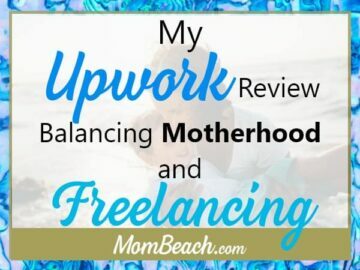 I try to create new blog posts every day if I can spare the time. Some blog posts, like this one, will take me more than one day to complete. 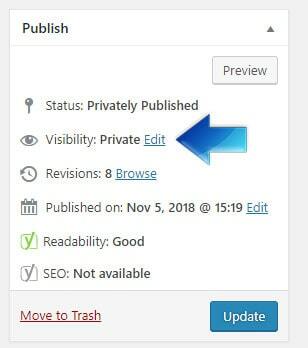 You can always start writing a post and set the visibility to Private in the area above the “Update” button. What I do is use my iPhone’s calendar to set times when I should write so that I don’t lose track of time. I been watching “The Haunting of Hill House” on Netflix lately so it can be hard to keep my blogging schedule. When you are first getting started, like I am, it is best to post daily or every other day. I just want to be able to start pushing quality content out in the blogosphere! 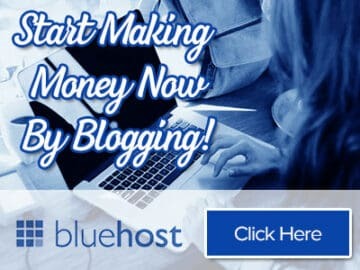 Now that you know how to start a blog with BlueHost, you can be heard in the noisy rock concert of the internet. Doesn’t it feel great to know that you are doing something constructive with your time that you could possibly earn a passive income from in the future? I am also available for hire if you want your blog set up and designed by an expert. Next Post: Should You Pick A Niche or General Store For Your Shopify Store?